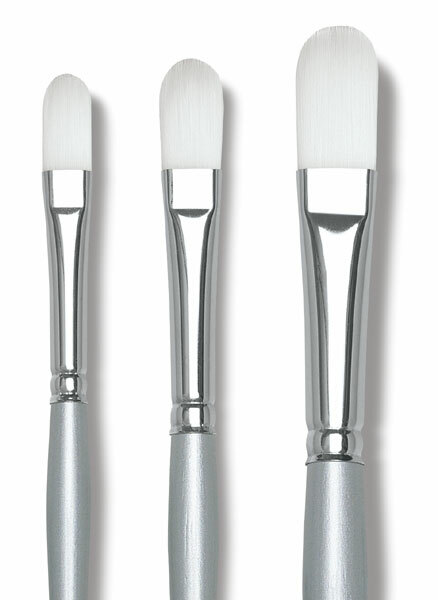 Silverwhite soft white synthetic brushes are manufactured using specially selected filaments of varying length and thickness that are blended together. This blend creates a special brush that will hold sharp edges in flats and fine needle points in rounds. You get the spring and color-carrying capacity of the finest natural hair brush at a fraction of the price. Seamless nickel ferrules are fitted onto long, polished white-tipped silver handles. 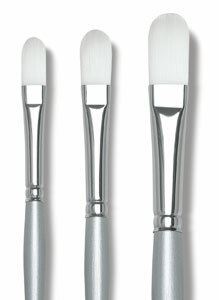 These brushes are suitable for use with acrylics, watercolor, gouache, water mixable oils, and all water-based media.